NEW YORK, Apr 17, 2012/ — Starting today, “Wedding Belles” will have access to a killer collection of designer wedding gowns on Bluefly’s flash sale site, BelleandClive.com. One lucky bride will also win a dream dress via the site’s “With this Pin, I Thee Win” companion contest on social networking pinboard and bride-to-be favorite, Pinterest. The BelleandClive.com boutique has a complete aisle-to-honeymoon offering including bridal gowns from the likes of Notte by Marchesa; designer shoes and clutches by Jimmy Choo, Yves Saint Laurent, Rebecca Minkoff, and more; and haute honeymoon picks. Bridesmaids are also attended to with cocktail frocks and formal dresses featuring bridal and red carpet favorites, Nicole Miller and Badgley Mischka Platinum Label. Grooms and their groomsmen can choose from a hip, sartorial selection that includes Tommy Hilfiger tuxedos and sleek suits by Prada, Paul Smith, Hickey Freeman, and Zegna. 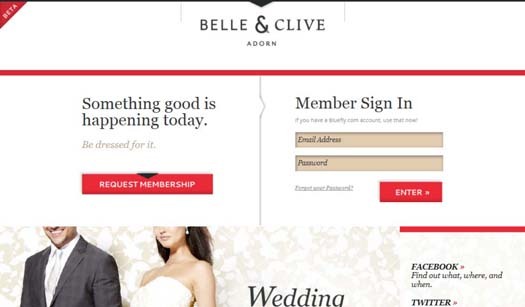 Belle & Clive’s wedding boutique will close May 15th; the contest on Pinterest ends May 1st.